Blogs > Technology > Is your library ready for the end of year rush? Is your library ready for the end of year rush? SPONSORED: James Breakell, UK Managing Director of D-Tech International, takes a look at how you can improve your library services to support your students better. University libraries are busy places all year round, but the final term is likely to see a significant surge as even the most revision-averse students dust off their library cards and head your way. Final exams, dissertations, end-of-year exams – we’re fast approaching the busiest time of year for the library and now, more than ever, it is crucial that your services are able to cope with the influx and demands. Learning trends in the 21st century are very different from the image of being buried in a pile of books, working in solitary silence. Bouncing ideas off one another in a relaxed social study space, at a time that suits them, is now an expectation. To support this, there is a need for 24/7 opening, access to technology, charging points, laptop loans, library services and even refreshments. If you are opening your library all day, every day, security needs to be at the forefront of your mind: for your stock, equipment, fixtures and fittings and, above all, for your patrons. Some universities have security personnel based in the library out of staffed service hours; some incorporate the library in general security patrols; and others rely on CCTV and people counters to monitor and access the need for staff attendance. Do everything you can to free up your staff to support your students. 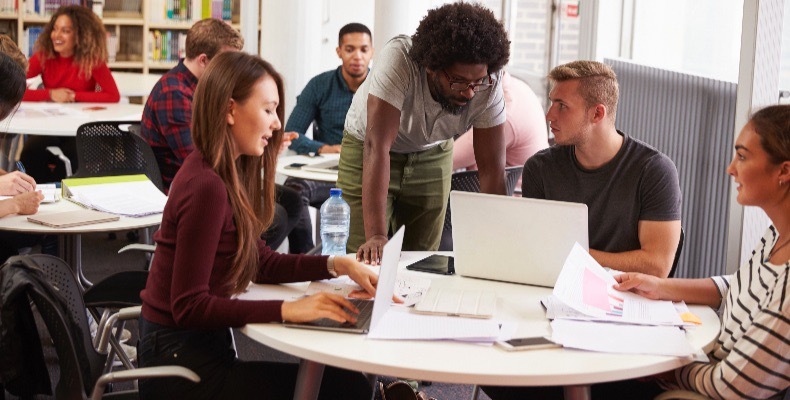 Don’t leave them stuck behind a desk all day processing borrowing and returns or checking out IT loans; students can easily do this for themselves, but they may need to call on staff expertise to make the most of your facilities. Depending on the size of your library, you may benefit from the data collected via a people counter to know where study spaces are and where your staff are more likely to be needed to answer queries and enhance the students’ library experience. Look at your library layout. Consider mobile furniture, shelving, even walls, so staff and students can create unique study spaces as and when required. Embrace the diversity of study styles while ensuring there is always an opportunity for patrons to find a quiet area to study if they need it. No one is denying that there is a space for digitisation in libraries and some students may prefer e-books for study, but statistics continue to show that the demand for physical tomes has not dropped. There have been numerous studies over the years looking at how much less information is retained after reading an e-reader. The general consensus is that it is easier to learn from a paper book; however, those with poor eyesight or reading disorders will most likely learn better from an e-reader. The fact that both options are available, and all students are different, suggests that libraries may benefit their users by offering both mediums. Whether it’s your busiest term or the start of freshers’ week, the library is one of the most critical departments in a university and needs to be pro-active rather than reactive to progress and innovation. D-Tech International designs, develops and manufactures high-performance RFID products and library security systems. We provide installation and customer service for our full range of products. If you are looking to increase the opening hours of your library, or require assistance improving your current system, we’re always happy to answer your questions, so visit our website or call on 01394 420077. Who’s been sleeping in your library? SPONSORED: D-Tech International, looks at the concerns raised by students sleeping on campus and the difficulties caused by opening around the clock.